Great news for frugal Singaporeans wishing to cheer for their team in the World Cup. 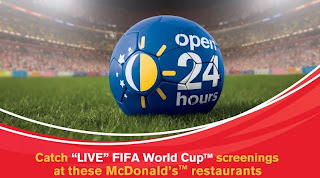 McDonald's will be screening the FIFA World Cup 2010 Live Telecast at 32 of its restaurants for FREE. 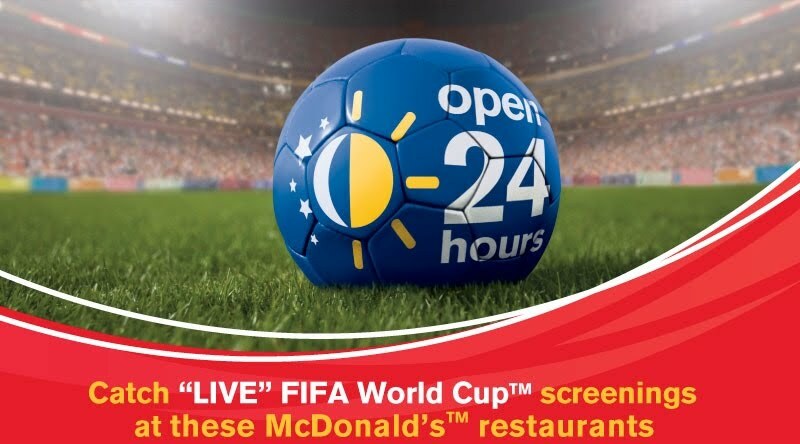 In addition, the fastfood chain has also teamed up with the Coca-Cola Company to bring customers a limited edition Coca-Cola Contour Glass series with the World Cup theme. The six different coloured glasses are each embossed with official 2010 FIFA World Cup football figures, carrying a different football pose showing a bicycle kick, header, kick, save, volley and strike. One glass is available free with every large Extra Value Meal (excluding breakfast).